Not enough time, or don't have a good photo? Just give them a GiveAmasterpiece Gift Certificate! After you complete your order, login with your Order # and your Last Name and click the Order Status link, then use the "Print Gift Certificate" button. * Any balance must be paid with a credit card. * Expires 12 mos from issue. On the next page you can change the Gift Certificate Value. 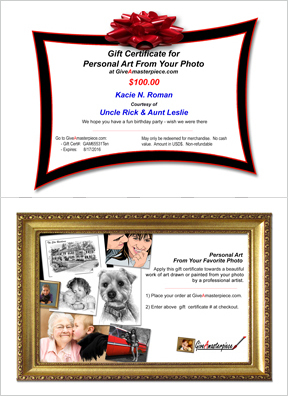 Copyright GiveAmasterpiece.com / Leading Edge Gifts LLC 2009-2019. All Rights Reserved. Stunning art from photos. GiveAmasterpiece is owned by Leading Edge Gifts LLC. We create innovative gift ideas that people have not seen before. Check out LeadingEdgeGifts.com. for cool gifts that are fun to give and even more fun to receive.